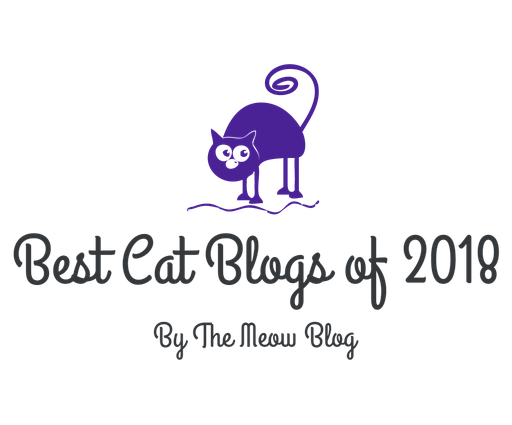 Wow, ten years have flown by since I made my first post on The Creative Cat on January 28, 2009. Here is my very first post. 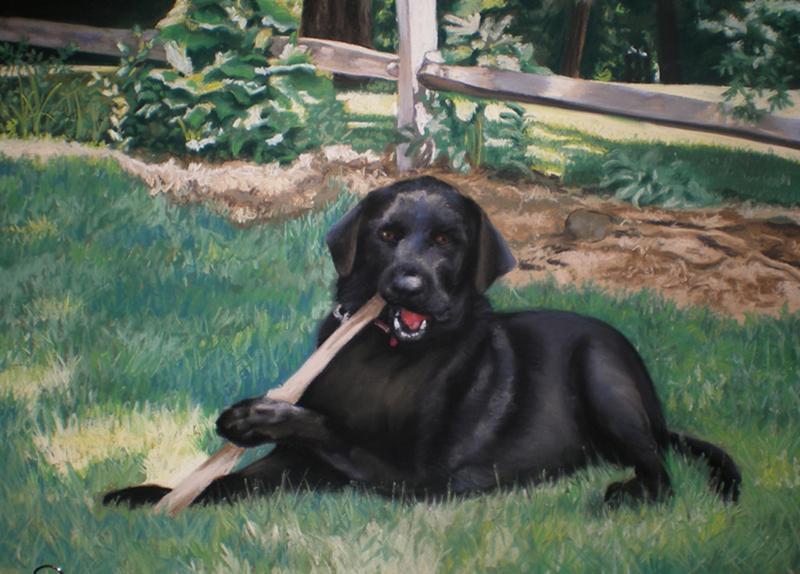 Here’s the latest version of Buddy-boy’s portrait. Black animals can be difficult, but I’ve had a lot of practice with the number of black cats who’ve shared my life. Here Buddy is in the shadow and in the original photo looks inky black with just hints of highlight. I’ve worked them out here and there, but he keeps ending up looking too shiny, almost plastic. Oh, well, at least the background has worked out well, and the highlights in that give guidance for the ones on Buddy! Still, I love this portrait because it’s so typical of a dog in his backyard, but it’s so special that someone wants to capture that silly moment. I was learning ever more about Namir’s hypertrophic cardiomyopathy and I realized we didn’t have much time left to share. I wanted to begin sharing him and what I’d learned about his HCM, and to give myself an online portfolio for my writing about cats. 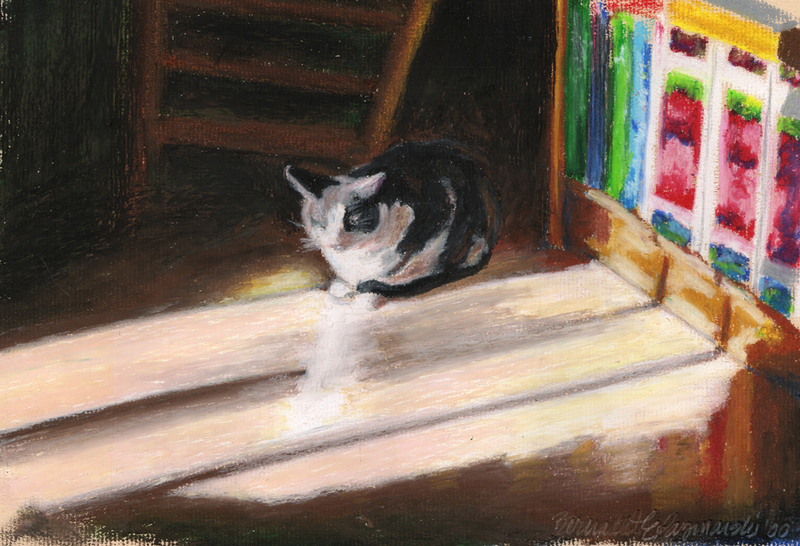 As the inspiration for this site, Namir is the kitty in the header and I’ve included the full painting at the top of this article. 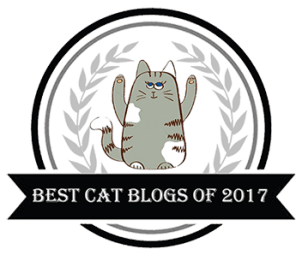 I’d been writing about cats in various other places for a while as well as sharing my art and photography, stories and poetry and merchandise on my website and various online profiles for years, but this was my chance to bring it all together in one place. Now, 7,267 posts and 22,010 comments and thousands of photos later I’ve definitely expanded and organized what I want to share beyond a half dozen posts every month. Here is what was happening the day I wrote my first post. Then the next day we celebrated the finish of the renovation of the bathroom. As time passed and I and wrote about the events in my household, and readers responded to posts and photos and other interests, I organized the topics that I still feature today. I lost Namir on July 1 that first year. Before that I wasn’t serious about posting regularly. His loss opened up a perspective on critical and palliative care and about sharing the loss of a pet. Along with my experiences of caring for a number of geriatric cats in the previous decade I decided to include essays about pet loss, and my set of Animal Sympathy Cards designed in Namir’s memory. I’ve also been able to share the passing of my feline inspirations, especially Cookie and Kelly in 2012 and Peaches in 2010, and all the good wishes and thoughts and prayers were very comforting to me at those times, as well as the thought that they will be remembered by many others. Then there were geriatric and hospice fosters too, Lakota and Emeraude, and Kennedy. I always hope that writing about their condition and their passing as well as my own grief helps to guide and comfort others in their losses. 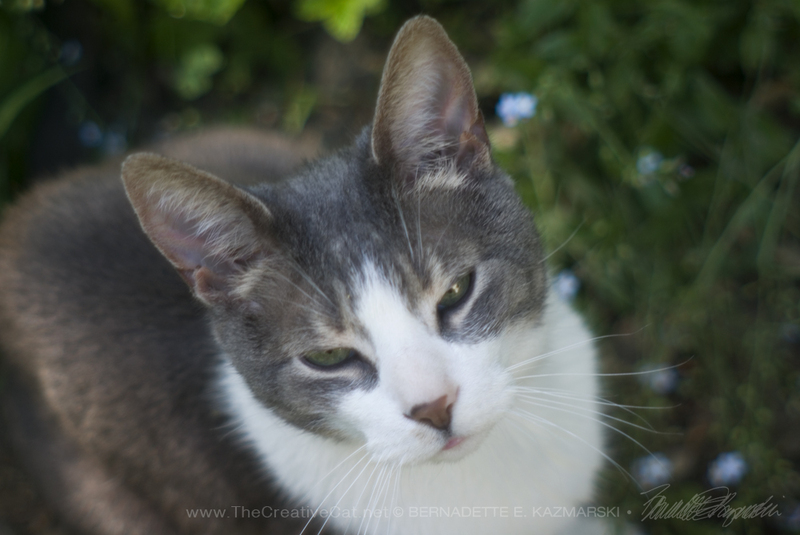 The garden stewards, Namir and Cookie, and the controlled chaos of my garden in spring. 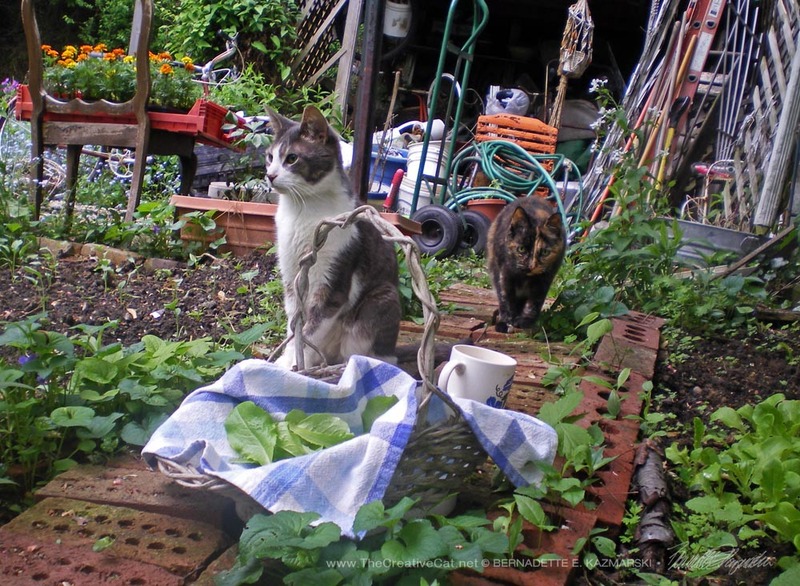 When I shared my photos of my cats in my back yard I realized that many people who enjoyed cats were also interested in gardening, wildlife, feeding birds and backyard wildlife habitats, so I added articles I’d written for conservation newsletters and expanded from there. From that idea I also began including occasional articles on living green with pets including information on using using safe and even homemade cleaning products, checking your art and craft materials for toxicity, finding cruelty-free health and beauty products and…using henna on your hair, one of my most popular “living green” articles. Mewsette models the bathroom sink. Believe it or not, I did not begin posting daily photos of my cats until August 2010, in part because I really didn’t have the time to really post something every day until then. But after the response to a few photos decided to go ahead and share a photo each day of something my cats were doing that day or the day before, artsy, cute, innovative if I decide to play around, and sometimes add in a vintage photo or a photo of a cat I’ve seen in my travels. The problem is never in finding one, it’s in finding only one! 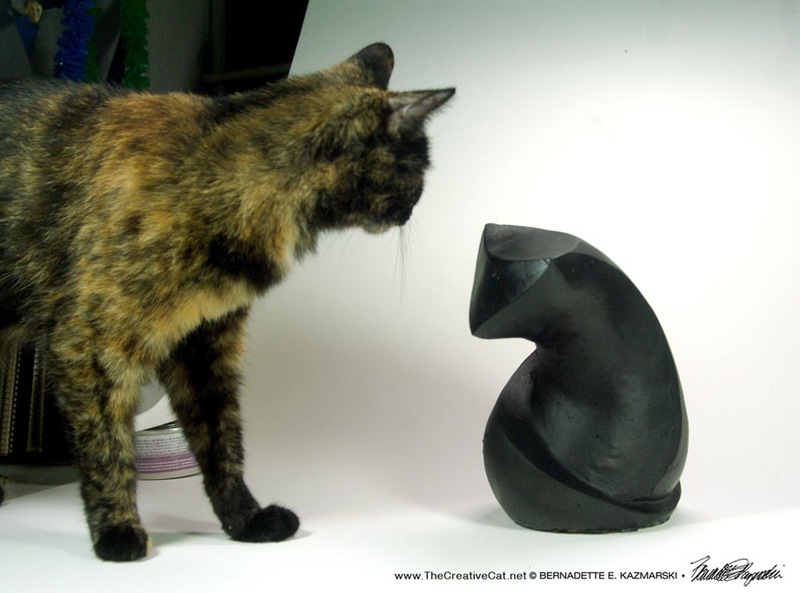 Kelly, acting as studio assistant, cautiously approaches the sculpture. In 2011 I found people were interested in reading about my process in both creating artwork and in creating products from that artwork. I added articles about my life as an artist and began seeking out other artists who create with cats and other animals and who I think you’d enjoy reading about, and writing about creative efforts from a technical standpoint so that non-artists can have a greater understanding of how we do it, and working or aspiring artists can read about anothers’ technique. In December 2011 I began posting daily sketches, well, nearly every day, and in the process reconnected with my own skills and visualization as an artist, and moved beyond what I knew to new media and styles. 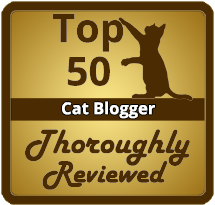 That’s become one of my most popular daily features, right after my daily photos featuring my feline family today and yesterday, especially my wonderful family of five black cats who everyone likes to see together no matter what they’re doing. 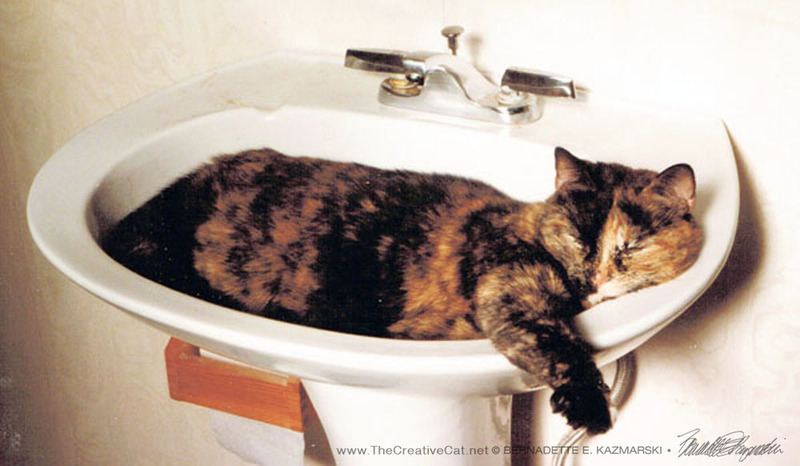 Cookie in the sink, a perfect fit (it was a very small sink). Possibly most gratifying of all, I’ve had the opportunity to share my experiences of rescuing cats in the past decades beginning with Cookie telling her own story in May 2010 in celebration of Peaches’ 100th birthday to sharing the stories of others in my feline household present and past, and other rescues for whom I’d found a home. So many of us have rescued cats over the years and telling my stories also tells the stories of many others who’ve quietly taken cats off the streets and into their homes to love and nurture, and also to find the perfect forever home for. This in turn led to producing Great Rescues Calendar and Gift Book and Great Rescues Day Book as I added the stories of cats whose portraits I’ve painted as a monthly feature, and finally in 2012 with “The Housewarming Cat” making these rescue stories a weekly feature. 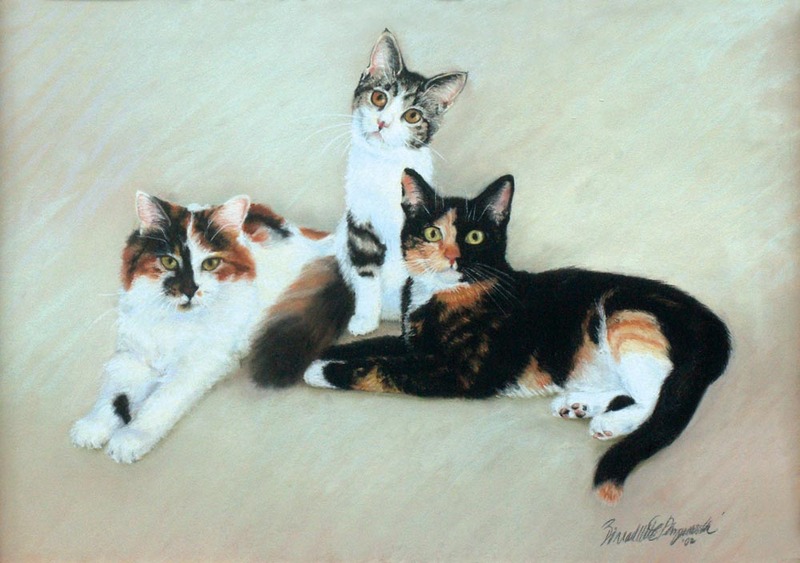 In 2012 I began with “Dorothy’s Pets” telling the story of a group of special needs cats who needed a home as their caretaker succumbed to a brain tumor, and from that point began a monthly, then weekly, feature of cats in need and cats for adoption, sharing the stories of the rescues that happen every day by caring people. Through these stories and working with rescue groups I’ve also been happy to offer incentives to donate to their support using my artwork and merchandise, both in direct sales and rewards. Since 2012 it’s also been a joy to feature a portrait or other piece of artwork each week as well, whether a current work under construction or one from the past, including detail images and an explanation of how I created the portrait, and, of course, the subject’s story. So many stories! It’s all a work in progress, not only to build what I offer, but also to build myself as a creative person. Though I’ve been determined not to take in rescues or fosters for a while, to take a little break from the emotional pull of it, the expense and time, and instead support others as much as possible, these two at 19 and 20 years old pulled at my heartstrings, having cared for and loved nearly a dozen cats at that age. 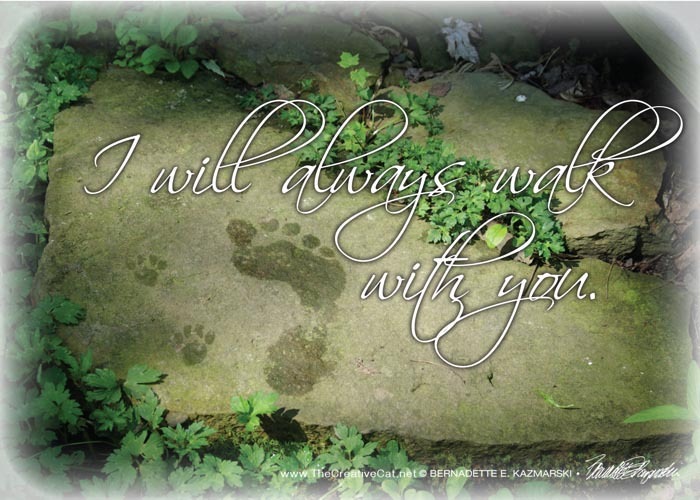 They joined our household in June, and though we lost Lakota in August he sent his message of living in the moment to our readers and inspired a new sympathy card dedicated to the brief time he spent with us. Emeraude, originally Jojo but she needed a princess name, has had her own journey of joining a new household at age 19, and also struggling with a chronic condition as she is now as well as inspiring new art. 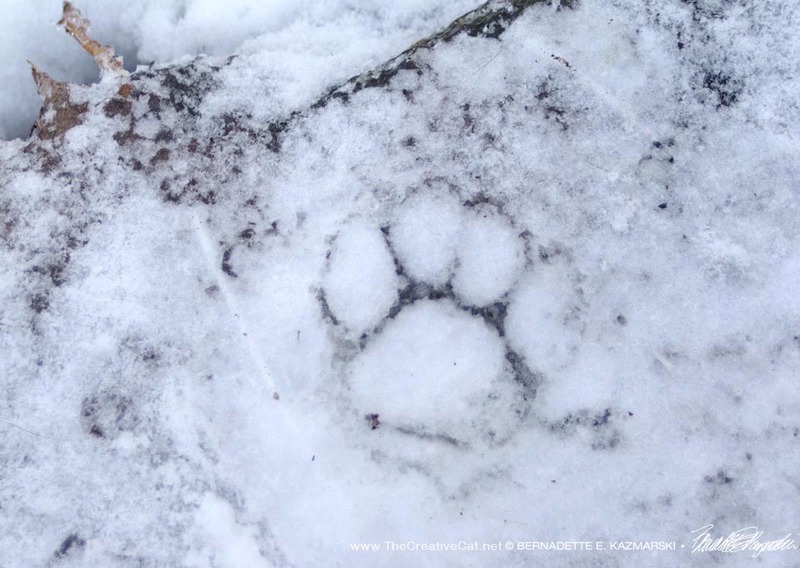 A pawprint frozen into the ice on my steps, with snow to fill. 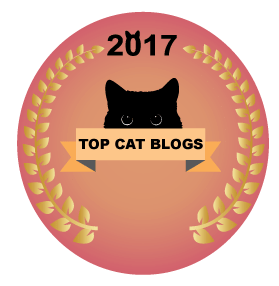 I had intermittently written articles about particular conditions or treatments, but in 2012 began to write weekly articles about health and safety for cats and other pets including topics ranging from properly washing pet food dishes to finding lost cats to helping cats, pets and other animals living outdoors. All of my new pursuits, including merchandise I’ve designed and sell, are guided by your readership, comments and suggestions. From my calendars to my garden flags, in 2012 I turned a good bit of my daily efforts to creating that merchandise, also turning my daily sketches and photos into greeting cards, wall art of various types, keepsakes and more. I have ideas every moment of every day and as I work my way through my daily experiments with my camera and art materials and writing, your feedback is always important to me as I choose which to pursue. For that reason the honor of my CWA President’s Award for this artwork is also your award because, without your feedback, I may never have even created this sketch, or known it was popular enough to create something people would buy and enjoy. Thank you for being there when I needed you, and I’m glad I could be there for you as well. Now, on to another 10 years with my Creative Cats! 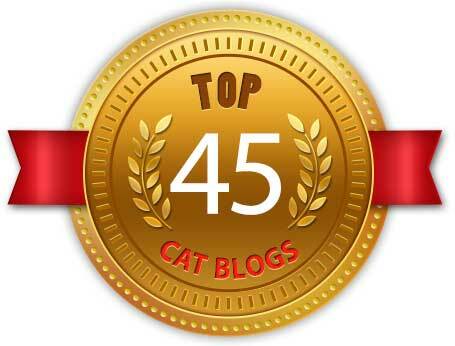 Congratulation on your blogoversary ! Congratulations, Bernadette, on maintaining such a stellar website for so many years! I look forward to it everyday! I don’t comment as often as I used to, a combination of things,but I always read your postings. 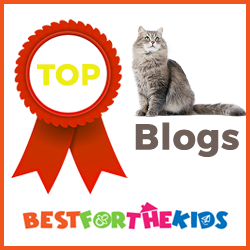 Congratulations on 10 years of blogging that is a terrific achievement! Ten years and a lot of work… creating beauty, saving lives and sharing experiences. Here’s to many more years of stories and pictures !